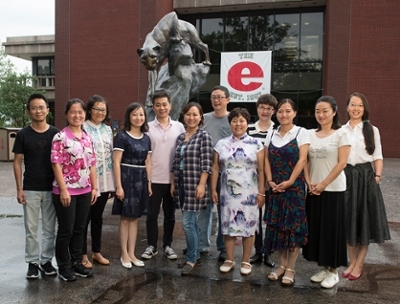 The Southern Illinois University Edwardsville International Training Program in Pedagogy (ITPP) is strengthening global perspectives and promoting intercultural exchange across the University by way of 12 visiting scholars from China, who will spend the fall semester on campus. The ITPP is in its fifth year, this semester hosting scholars from two Chinese universities, including nine from Northwest Normal University (NWNU) and three from Sichuan University of Science and Engineering (SUSE). “This program is part of SIUE’s broader effort to achieve greater global recognition, and it directly supports the University’s mission of developing professionals, scholars and leaders who shape a changing world,” said Paul Rose, PhD, assistant dean in the School of Education, Health and Human Behavior and ITPP leadership team member. The scholars specialize in a range of academic disciplines, including life sciences, philosophy and politics, education, economics, foreign languages and literature, and material and chemical engineering, among others. While at SIUE, the visiting scholars will live in Cougar Village. During the semester, they will observe classes in the College of Arts and Sciences, and Schools of Business, Engineering, and Education, Health and Human Behavior. They will also make three presentations throughout the semester that will be open to the campus community. Program goals include exposing the Chinese faculty to American style pedagogic practices, preparing them for teaching their respective disciplines in English, and expanding awareness of how English is utilized in the American university classroom. Additionally, the ITPP provides SIUE opportunities for personal interaction with Chinese faculty and students that will facilitate cultural understanding, and curricular and research collaboration. Photo: Visiting scholars in the International Training Program in Pedagogy include (L-R) Yiqiang Yang, Xuefei Li and Lianxia Li, from Sichuan University of Science and Engineering, and Yaohua Wang, Kefang Jia, Aiqin Sun, Jie Du, Xiaomei Wang, Jiong Guo, Jing Wang, Meijiao Shan and Jinyun Li from Northwest Normal University.